Dillard University is a private, historically black liberal arts college in New Orleans, Louisiana, United States. Founded in 1930 incorporating earlier institutions that went back to 1869, it is affiliated with the United Church of Christ and the United Methodist Church. The campus is near Gentilly Boulevard and the London Avenue Canal, established in the 1930s. The history of Dillard University dates back to 1869 and its founding predecessor institutions--Straight University (later to be renamed Straight College) and Union Normal School (which was to become New Orleans University). 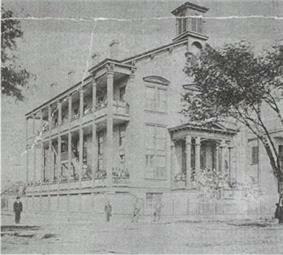 Responding to the post-Civil War need to educate newly freed African Americans in New Orleans, Louisiana and the surrounding region, the American Missionary Association of the Congregational Church founded Straight University on June 12, 1868. Straight University also offered professional training, including a law department from 1874 to 1886, and its graduates participated in local and national Reconstruction and post-Reconstruction era civil rights struggles. Straight University was renamed Straight College in 1915. The Union Normal School was established by the Freedman's Aid Society of the Methodist Episcopal Church on July 8, also in 1868. In addition to Straight University, the AMA helped found several other Historically Black Colleges and Universities, such as Clark Atlanta University, Fisk University, Hampton University, Howard University (with Freedmen's Bureau), Huston-Tillotson University, LeMoyne-Owen College, Talladega College, and Tougaloo College. Straight University and Union Normal School later became Straight College and New Orleans University, respectively. Both schools offered elementary level education, but quickly enlarged curriculum to include secondary, collegiate, and professional level instruction. New Orleans University operated a secondary school--Gilbert Academy. By the 1890s, the university offered professional medical training. It included a school of pharmacy, the Flint Medical College, and the Sarah Goodridge Hospital and Nurse Training School. 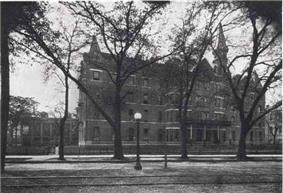 After the medical college was ended in 1911, the Flint Goodridge Hospital emerged and continued nurse training. Local Black and White leaders felt there was a need for a larger, more notable African American institution of higher learning to emerge within New Orleans and the greater South. Due to economic hardships and rounds of negotiations between the two institutions, Straight College and New Orleans University chartered Dillard University on June 6, 1930. Named after James H. Dillard, the new university was created to "... offer a traditional liberal arts curriculum—rather than nonprofessional, vocational training" and emphasize a close engagement with the Black community through "various education extension programs, societies, and clubs." Despite the hope of this new charter, the building of Dillard University was tempered by its context of Jim Crow America. Many local Whites took concern with the possibility of a Black president presiding over White faculty members. Similarly, the increased numbers of African American bus riders in the Gentilly area disturbed some White sensibilities. As an influential and diplomatic member of Dillard's board of trustees, Edgar B. Stern suggested Will W. Alexander as a suitable compromise. Will W. Alexander, a white Southern preacher, was Dillard's first acting president (1935–1936), whose experience as the director of the Commission on Interracial Cooperation proved valuable. Dillard University opened its doors in the fall of 1935, and was able to attract a number of prominent scholars, such as Horace Mann Bond, psychology and education; Frederick Douglass Hall, music; Lawrence D. Reddick, history; and St. Clair Drake, sociology and anthropology. In August 2005, the campus, not far from the lower levee breach of the London Avenue Canal, suffered extensive flood damage in the aftermath of Hurricane Katrina. Nelson Hall was destroyed by a fire. A bus fire also destroyed belongings of 37 students who were in the process of being evacuated. In 2003, musician Ray Charles added a provision in his will to endow a $1 million professorship of African-American culinary history at Dillard. It is the first such position in the country. In preparation for graduate and professional schools, undergraduates are encouraged to work closely with a faculty member to produce a high quality undergraduate research projects. The university is a member of the Council of Undergraduate Research and the National Council of Undergraduate Research. Most departments offer courses in methodology, and the university's Office of Undergraduate Research organizes additional workshops on writing proposals, analyzing data, and using human participants. Students can participate in A Katrina Recovery Initiative (AKRI), Louisiana Alliance for Minority Participation (LAMP), and the Undergraduate Research & Creative Work Competition. The university also produces the Dillard University Journal of Undergraduate Research (DUJOUR), which publishes the findings and articles of finished undergraduate research projects. Nurtured in the "Birthplace of Jazz," Dillard University recognized the unique possibilities that is provided by this context. The Institute of Jazz Culture was established in 2002 by founding director, Irvin Mayfield at the intersection of community, jazz and education. Under the current leadership of Edward Anderson, Assistant Professor of Music and Director of the IOJC, the Institute is producing curriculum and programming on the collegiate and the secondary levels. It emphasizes the development of talent and promotes professional opportunities. Preservation, promotion and celebration through documentation, education, and performance of jazz culture are the central goals. DUICEF (Dillard University International Center for Economic Freedom) is the university's newest building, dedicated in 2004. It houses the offices of the Division of Education & Psychology and the Division of Social Sciences, and computer and language laboratories. Rosenwald Hall is a hall at Dillard University. Dillard's first permanent building was originally the campus library. It was built in May 1934. The building is named in honor of philanthropist Julius Rosenwald, to whom the building was dedicated in June 1948. This building houses the university's administrative offices and was under construction due to damage in the aftermath of Hurricane Katrina. It will be fully operational in the fall 2008. Will W. Alexander Library is Dillard University's library. It was built in 1961. The library was dedicated in honor of the first acting president of Dillard University, the Rev. Will W. Alexander on October 22, 1961. The library houses an extensive collection of books, journals, microform and newspapers, as well as such historical documents as the papers of the American Missionary Association of the United Church of Christ. The library was damaged in the aftermath of Hurricane Katrina and reopened as a state-of-the-art facility in April 2008. 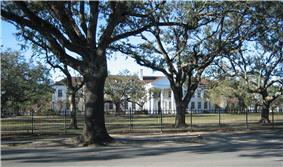 Camphor Hall is a hall at Dillard University, New Orleans. It was built in 1947. This female dormitory was originally a male dormitory. The building was named in honor of a Louisiana native, educator and missionary, Bishop Alexander Priestly Camphor. Hartzell Hall is a dormitory at Dillard University. It was built in 1935. Hartzell is named in honor of Joseph Crane Hartzell, a missionary bishop for the Methodist Episcopal Church. The building was originally a junior and senior female dormitory, and re-opened in the fall of 2013. Straight Hall is a dormitory at Dillard University. It was built in 1936 and renovated in 1957, Straight Hall was originally a female dormitory in its earliest days. The building is named in honor of Seymour Straight, president of the Board of Trustees of Straight College, which opened in 1869 and later in 1930 merged with New Orleans University to form Dillard University. Re-opened in the spring of 2013. Williams Hall is a female dormitory building located to the left of Kearny hall. It was dedicated in honor of noted New Orleanian educator and philanthropist Fannie C. Williams (1882–1980) in June 1946. The building was renovated in 2000 and became a co-ed dormitory in 2004. Dent Hall at Dillard University, New Orleans, is the university's gymnasium. It was named in honor of Dr. Albert W. Dent, the university's third president. It was built in 1969 at the end of his service. Dent Hall is the home of the Bleu Devils and the Lady Bleu Devils basketball teams (Athletics Department). In this building are The Division of Campus Life, Career Services, Student Development, Student Government Association, the Honors Program, offices, classrooms, computer labs, a dance studio, a weight center and a newly renovated swimming pool. William H. Cosby, Jr. 2006 Ed.D. Victoria Holloway Barbosa, M.D., M.P.H. Ambassador Andrew J. Young, Jr.
^ "Community Responds with Donations for Hurricane Evacuees from Dillard University at Centenary College". Retrieved 30 November 2008.